Clive Kirk (at Hymers 1941 – 1947) visited Hymers on Friday 29th June 2018 with his wife Angela. Clive and his wife Angela were keen to attend the school’s annual Garden Party. Arriving in Hull the day before, they decided to take the opportunity to visit the school for a tour. Regular attendees of the OH Southern branch London dinners, they last visited Hull back in 2012. 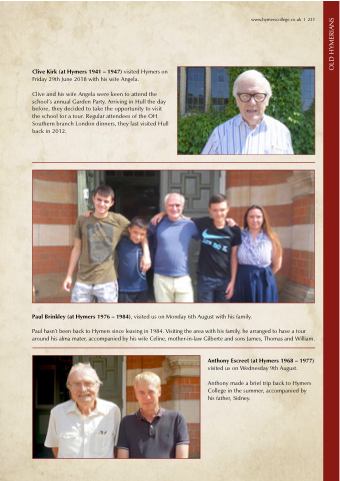 Paul Brinkley (at Hymers 1976 – 1984), visited us on Monday 6th August with his family. around his alma mater, accompanied by his wife Celine, mother-in-law Gilberte and sons James, Thomas and William. visited us on Wednesday 9th August. Anthony made a brief trip back to Hymers College in the summer, accompanied by his father, Sidney.